We stayed in the water at the yard overnight in order to sort out the paperwork empty our bank account and say our goodbyes before leaving Tuesday morning. I will not miss either the steps, the lack of dog walking or the bloody wind turbine; but I shall miss the friendship and companionship freely given plus the amazing amount of knowledge and professionalism available in Nieko’s yard. Dwaine and Susannah offered me lifts to get provisions and directed me as to where I could get what. Dower came with us and negotiated a deal with an elderly, non English speaking, elderly Friesian gentleman to help find me a 2nd hand bike that fitted and suited me – which G then left me to cycle home on in the dark. I went shopping on it the next day and somewhat overloaded the panniers, falling off it in the yard as I came to a halt. I’m still rubbish at landings but, hey ho, I didn’t smash any wine and the holes in my knee and thumb are healing. 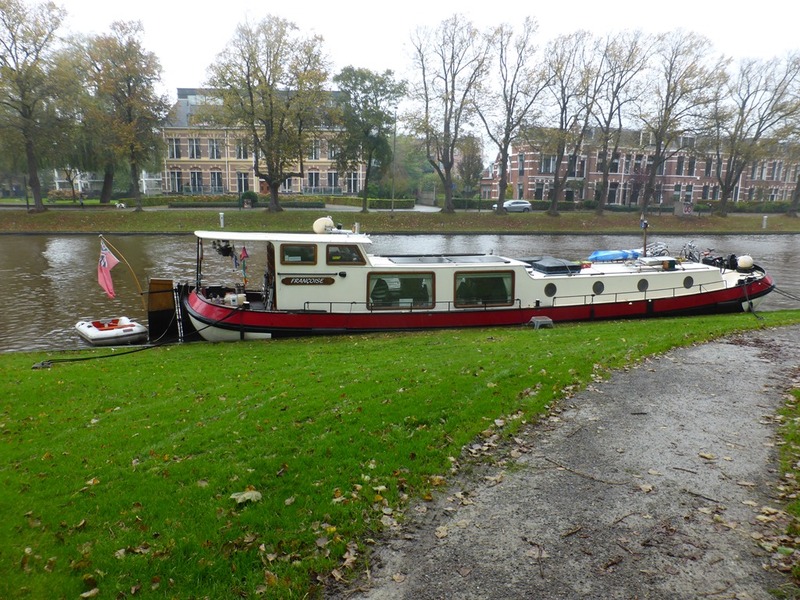 Back into Leeuwarden again where we had parted company with Veronica and Richard, we moored parkside opposite Jill and Gary on Noorderzon whom we had been trying to catch up with, but narrowly missing each other, for quite some time. so we cycled around to their side for tea and cuddles with their dogs and they delayed their departure so we could all go out and have dinner in the Irish bar. That was the first time I’d drunk Guinness in years and years – it used to be my drink of choice – jolly nice it was too. 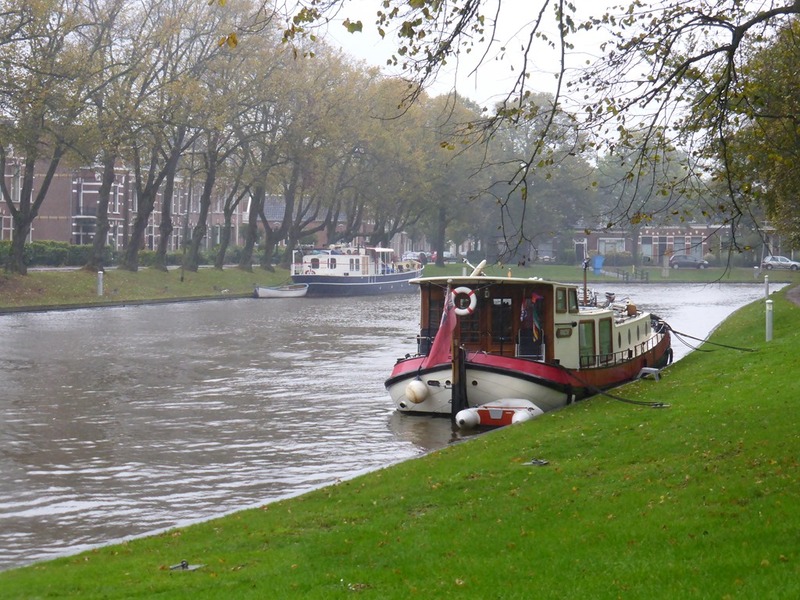 Then we moved out onto the free Marrekrite moorings joining Noorderzon. 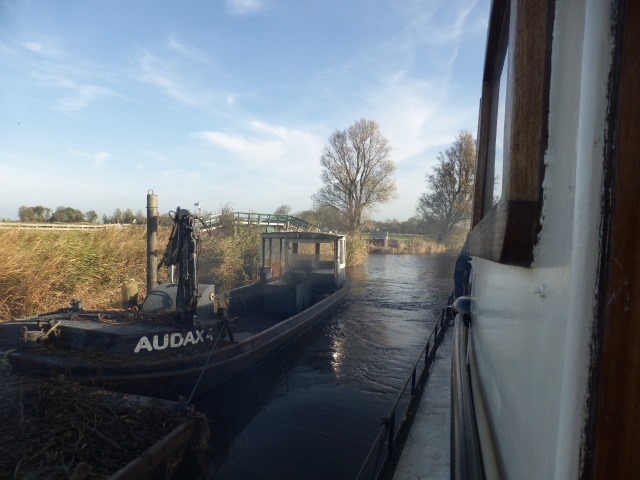 Next morning G was down the forepeak ‘ole when he heard a loud bang and clambered out to see a pusher tug with a gondel (flat platform for loading stuff onto) drifting towards us, sideways, with the tug engine on fire. My immediate reflex reaction to this was a selfish, ‘nooooo, not my new paintwork!’. The wind spun him and drifted him against the reeds on the far bank and we could see him making a phone call/calls. 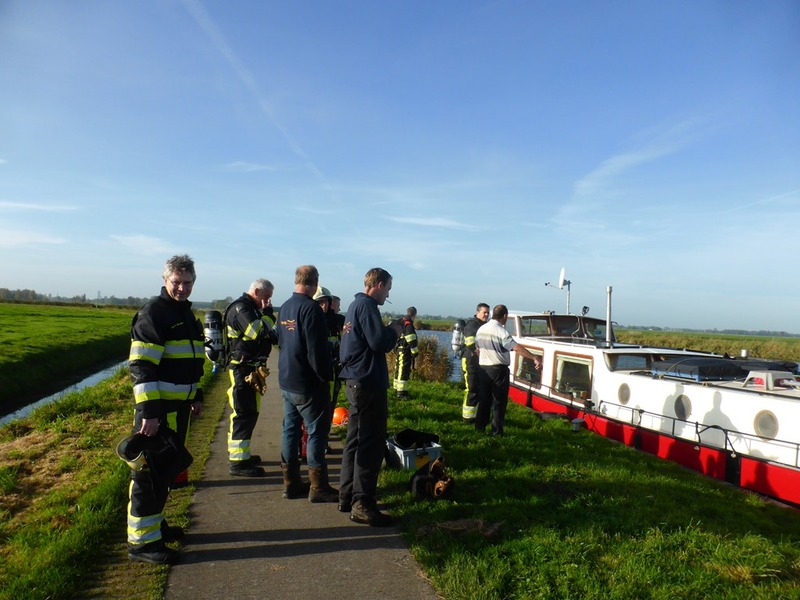 He had shouted to a couple of Dutch guys on the towpath our side that he had no fire extinguisher and no anchor (he did have a spud pole but that was adjacent to the on fire engine). I shouted Gary from next door and the 3 of us set off on Francoise to the other side of the river armed with fire extinguishers to get him off. 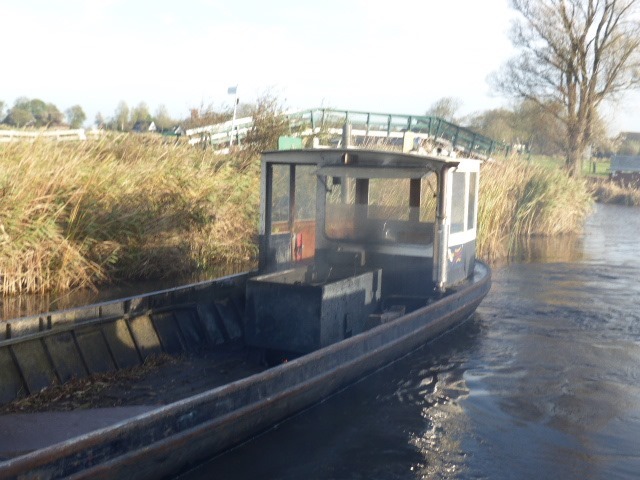 By the time we reached him, he’d made an almighty adrenaline fuelled leap across the gap to the bank and, try as we might, the 3 of us could not operate the boat in shallow waters and get in with the fire extinguishers – as we were alongside to his burning engine (but not close enough to be effective or leap across) it did occur to me that there could be something on there that could explode. Somewhere around here Gary shouted that the fire fighters had turned up, but they were on the wrong side of the bank! 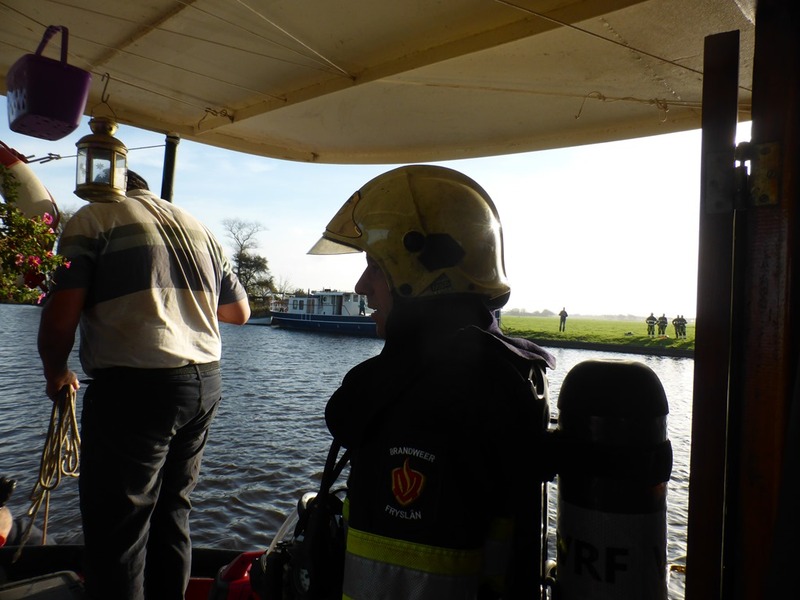 Given that the chap was safely on the bank and no longer in danger, we returned to pick up the young, fit, professionals. 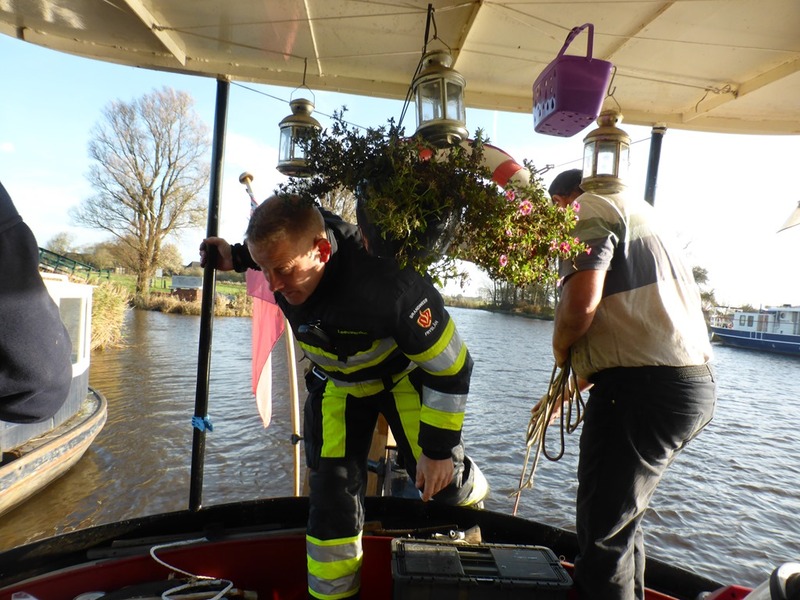 The easiest and quickest way to do that was to pull alongside Noorderzon so that they could ferry themselves and their equipment across her and onto Francoise so we could take them back across to the stricken vessel (I’ve always wanted to use that expression). 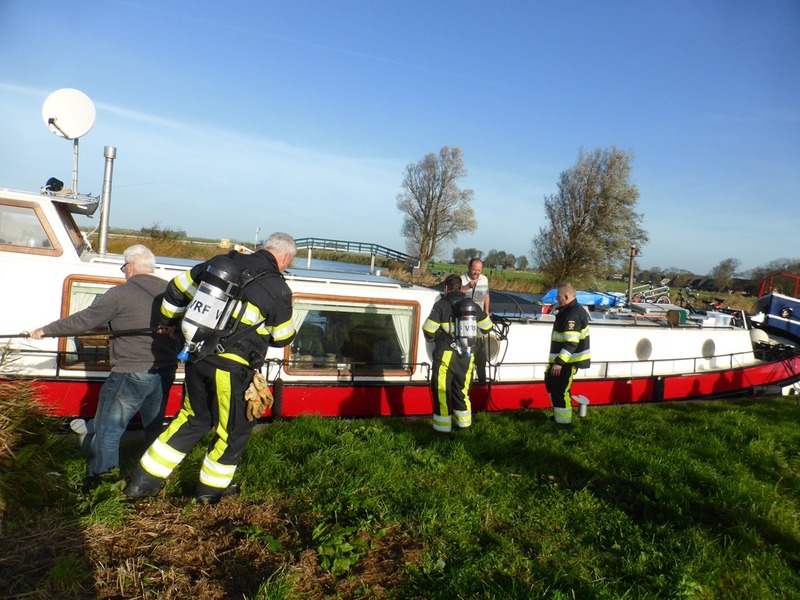 It was at this point that the other Jill woke up and appeared in her dressing gown in time to see her boat being boarded by hunky fireman – I bet she had to pinch herself! 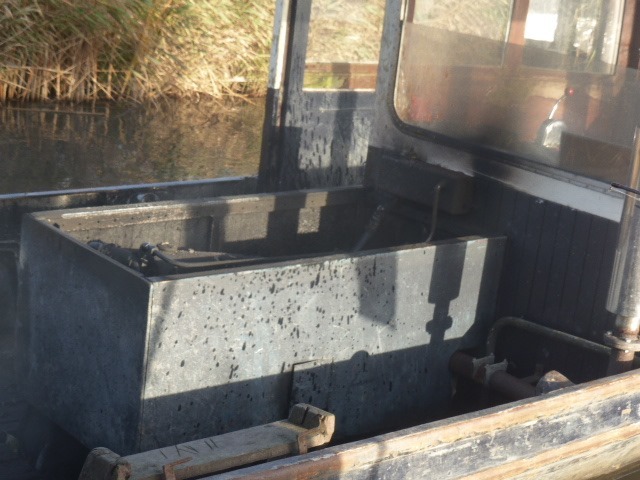 With the three of us free to position and crew the boat and leaving the fit young professionals to do what they were trained for, it was considerably easier (sorry, the words ‘fit’ and ‘young’ keep cropping up). Let’s face it, between us three we sported one knee replacement, one hip replacement and someone that would probably benefit from one of each! 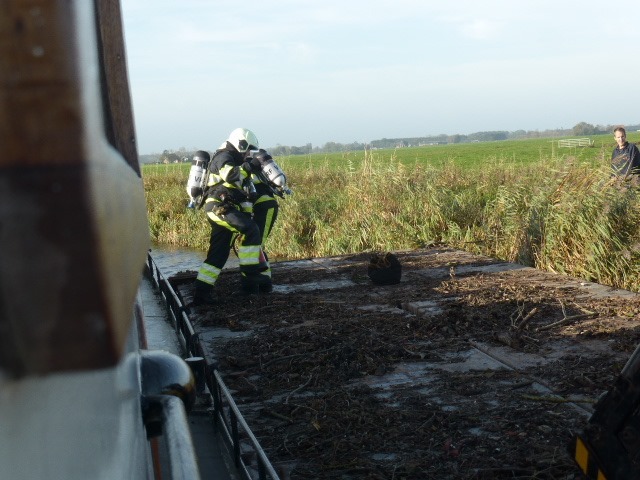 Fire dealt with, the skipper had to be recovered from the bank, there was no way he was going to leap back on. 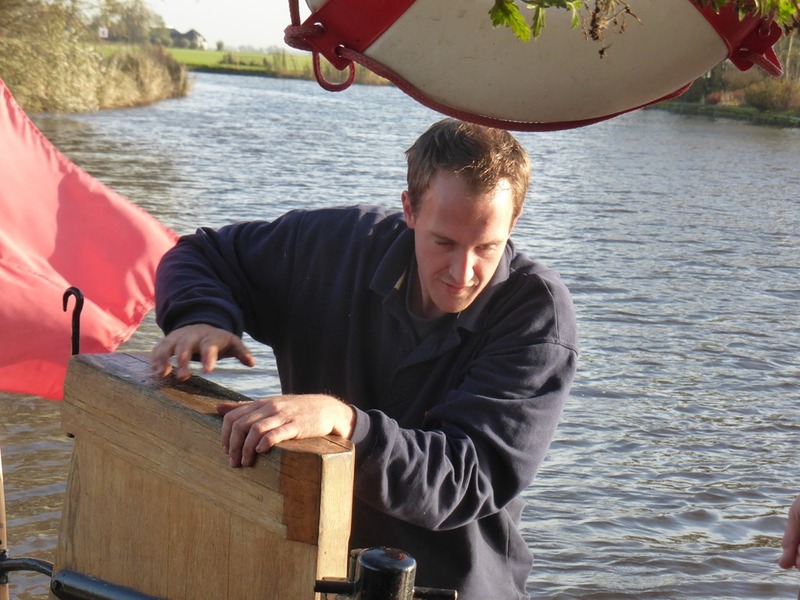 We tried to push the gondel into the bank but, due to shallow waters, all we achieved was more holes in our new paint. 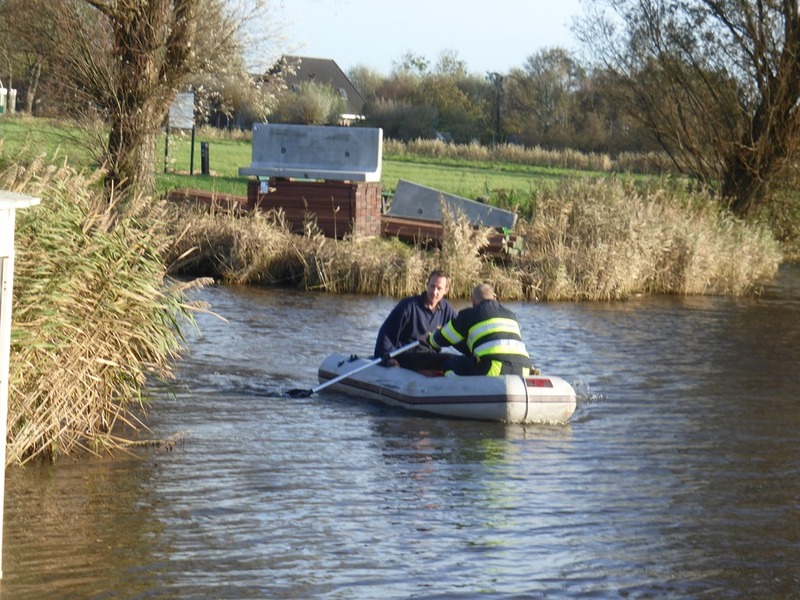 We still had the dinghy, but no battery for the electric outboard and the rowlocks for the oars had broken away, only being lightly re-attached with super glue! 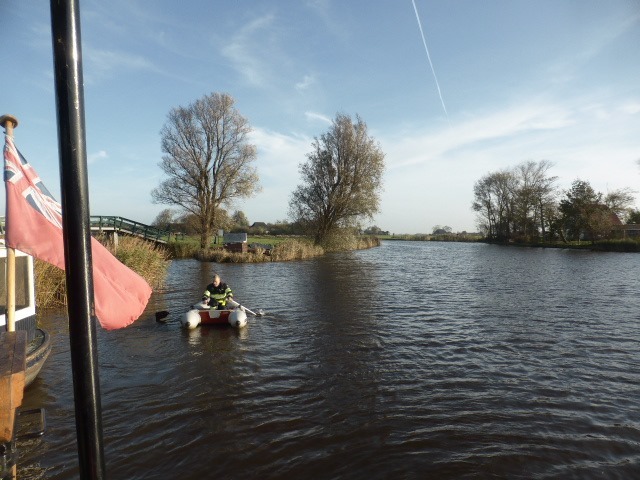 So the oars were unearthed and the boss fireman was despatched down our rudder into the dinghy with distinct instructions not to row hard – his crew were, at this point, in hysterics. 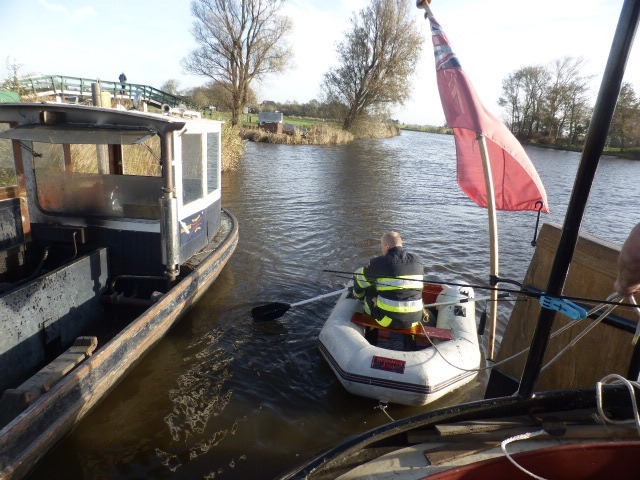 He dutifully returned with the skipper and both returned up the rudder and we returned to our original mooring where the rest of the fire crew were waiting to pull us in – plus a couple of policemen. 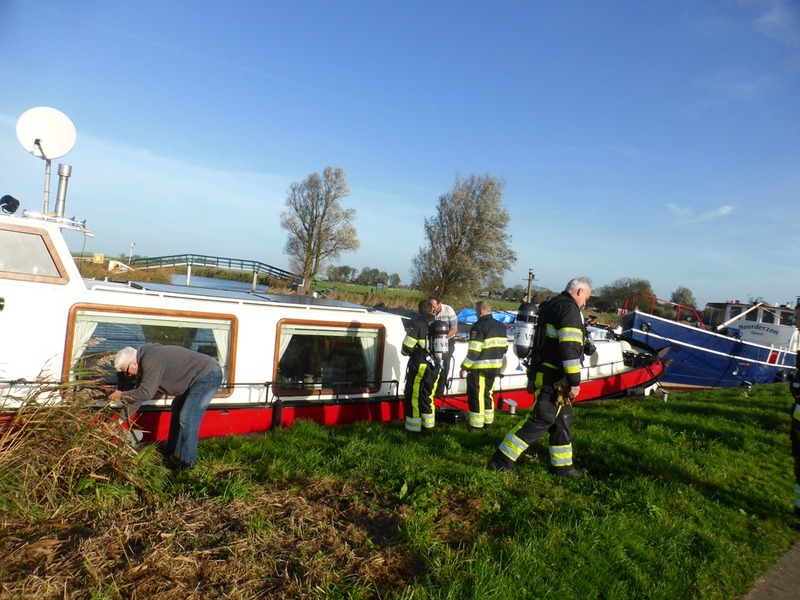 It was then necessary for everyone to shake hands with everyone – which took some time – and big fusses made of both our and Jill and Gary’s dogs whom we let out because, as you can imagine, were all going a bit nuts from having had their boats invaded. More than enough excitement for one morning before coffee! Should we rename Francoise, ‘Thunderbirds’, European rescue? This entry was posted on 22/10/2017 at 3:07 pm	and is filed under Uncategorized. You can follow any responses to this entry through the RSS 2.0 feed. You can leave a response, or trackback from your own site. I’m sorry to hear that you fell of your bike, hopefully you’ll be healed up soon. If you’d drank the wine while cycling along it might not have hurt quite so much. 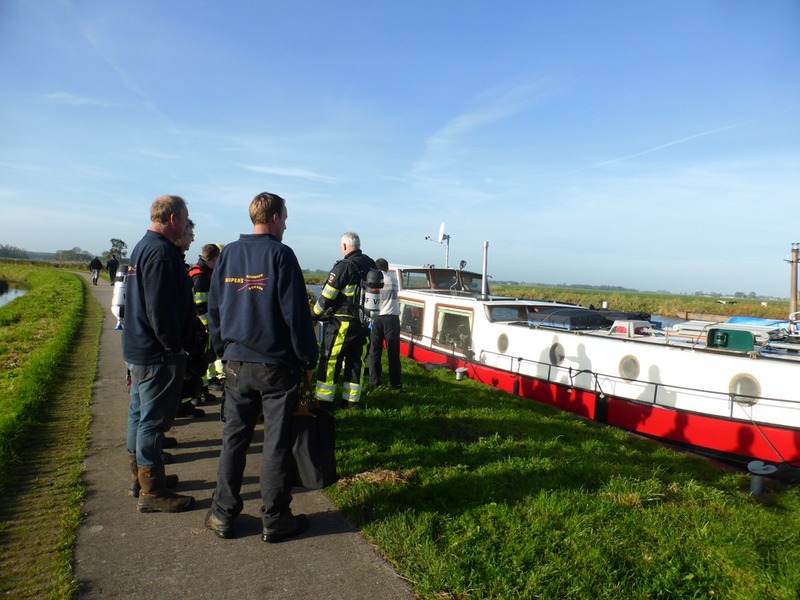 Let’s hope that that is the ONLY time that you require Firefighters around or upon Francoise, though in the photos with the Fire crew that red paintwork does look a little prophetic. I am also sorry to hear that your landing technique is a little self destructive, maybe putting your feet down when you stop would help? My first thought was that an adult Tricycle would be a good idea (they make them as electric bikes as well), but your Gin Palace doesn’t come with a Davit in the foredeck to load/unload one so not practical at all. I hope that the wounds are healing and not too sore, with colder weather on the way soon. Funnily enough, we did get a quote for a davit whilst in the yard but felt the money was needed on higher priorities. Quite an adventure. 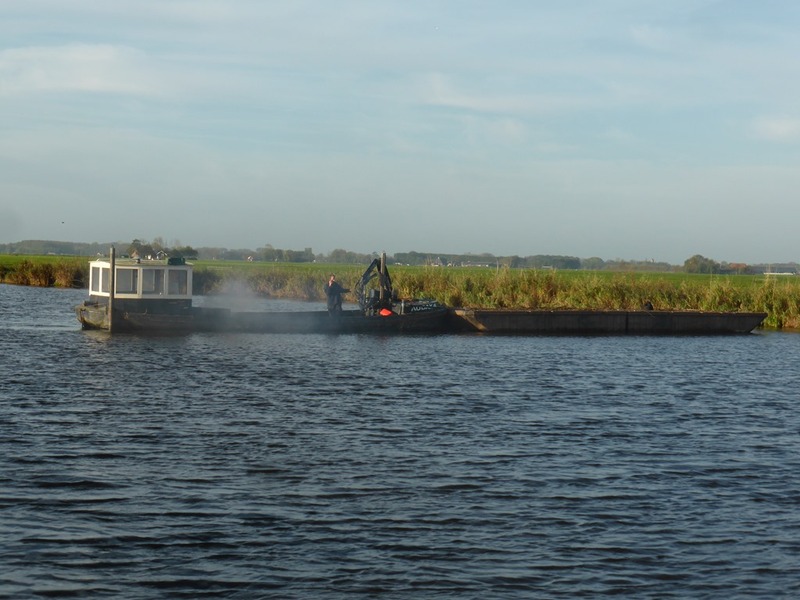 I found a small news article with pictures of your action: http://ditisfryslan.frl/2017/10/13/brandje-op-werkschip-snel-geblust/ . 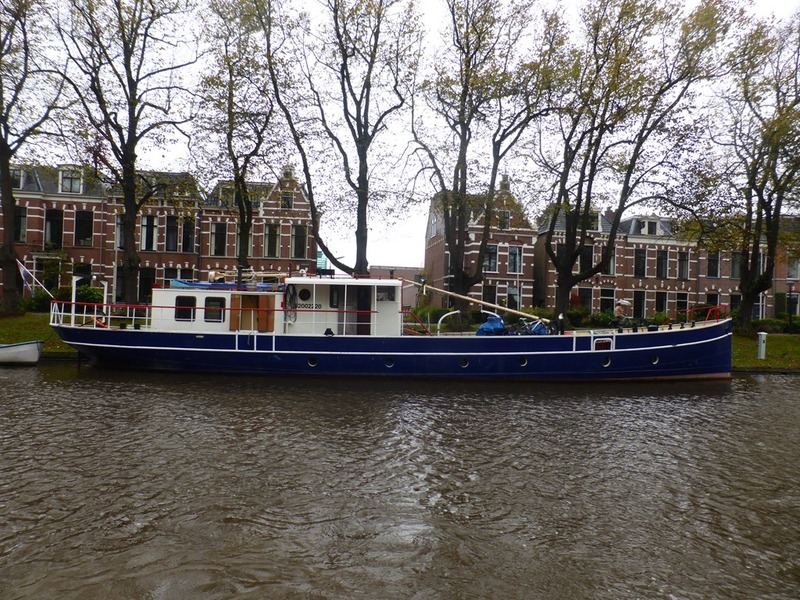 I saw the Audax (the ‘stricken vessel’) in Leeuwarden recently with the burned engine and wondered what had happened, now I know. Poor you and your bike! 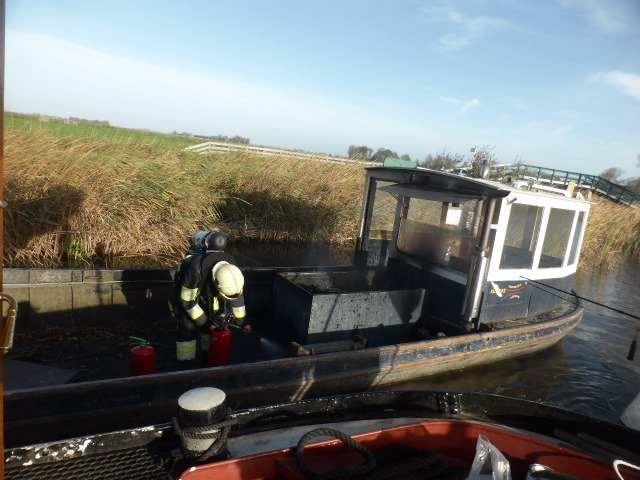 I hope you landed…sorry…didn’t land in a puddle…Such excitement with the fire boat. Goodness, what next!? Keep safe, dear Jill and G! No puddle and, fortunately, no-one except G looking; embarrassment always being the main consideration before injury assessment. I am so rubbish.